We invite you to the protest that will be held in front of the McDonald's restaurant in Jurisiceva ulica, on Tuesday, November 27, 2001, at 12:00 noon, that we have organized in order to draw people's attention to the animal suffering, as well as the planet and human health destruction. Those are the three problems we believe are closely connected with the McDonald's company. Because of its business, people throughout the world began to dislike McDonald's and declared October 16 the World Anti-McDonald's Day that is also the UN World Food Day. 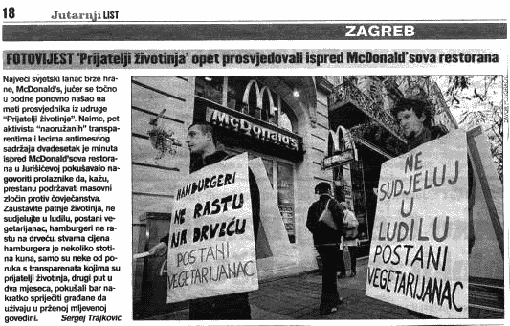 Animal Friends also participated in the worldwide protest against this multinational company by its 24-hour action in front of the McDonald's restaurant in Jurisiceva ulica in Zagreb. On Tuesday, November 27, 2001, Animal Friends will hold another protest at the same location, in front of the McDonald's restaurant in Jurisiceva ulica, beginning at 12:00 noon. McDonald's is the world's greatest beef consumer, and as such industry largely contributes to the ecological crisis caused by global warming, environment pollution and violence against animals. By the production of unhealthy food, the company causes serious damage to human health, especially to children and helps them develop bad nutritional habits by its propaganda. When it comes to the world's greatest beef consumer, one cannot avoid to mention the mad cow disease, which caused a crises that has already spread to Slovenia, and that also bothers our citizens more and more each day. We would like to point out that McDonald's restaurants serve unhealthy food that is harmful for people, and that they manipulate the children with various toys and presents, as well as lies told by their mascot, Ronald McDonald - who, among other things, assures the children that "hamburgers grow on trees." Since the public did not quite understand the essence of our protest during our previous protest, we kindly ask the press to give consideration to the question why people throughout the world dislike McDonald's much more than the local fast-food restaurants. Although each of those restaurants contributes to the torture of animals, McDonald's, as a huge multinational company, participates much more therein, as well as in spreading the advertising lies to children and adults. Since McDonald's declared through its representatives that nutritional habits are a personal responsibility of every individual, we would like to point out that the "habits" causing the trees to be felled, species to be exterminated, environment to be polluted, millions of animals to be killed and human health to be destroyed, are not a personal responsibility of every individual, but of the whole community. They particularly destroy the health of our children that McDonald's turns into its "regular customers," i.e. unhealthy food junkies, from their childhood, by giving them toys, organising birthdays, play areas and clowns for them, advising their parents against cooking at home, as well as by other advertising tricks that are harmful for the whole community.